Small dust grains consisting of aggregates of spherical monomers are seen with increasing frequency in fields such as dusty plasmas and observational astronomy. In many cases the only possible experimental data that can be collected from these aggregates is via the light they scatter or transmit, making it difficult to determine characteristics such as size and shape. This paper investigates a method for modeling the optical properties of aggregates created by computer simulated BCCA (Ballistic cluster-cluster aggregation) and BPCA (Ballistic particle-cluster aggregation). The extinction, absorption and scattering efficiencies were determined by the FORTRAN code SCSMFO1B. This code utilizes a superposition technique based on Lorenz/Mie theory for light scattering of multiple spheres. The results indicate a relationship between the observed optical properties of aggregates and their size. However the charge used doesn't contribute to any noticeable different in the optical efficiency factors for aggregates. The use of light as a diagnostic for finding the physical attributes of an object is referred to as the "inverse scattering problem." A solution to this problem can be beneficial in many situations that are difficult or impossible to examine by other means (Richardson 1995), such as the light scattered from dust in protoplanetary clouds. The objects of interest in this study are aggregates formed from spherical monomers and can be described as fluffy dust grains on the order of tens to hundreds of microns in size. The properties of such aggregates are very important in many areas ranging from semi-conductor manufacturing, clean room filtration systems and theoretical and observational astronomy. Recent evidence shows that growth and accumulation of aggregates is taking place in the protoplanetary disks around newly formed star systems. These findings lead to more questions regarding the physical properties of the aggregates, but the only obtainable information for studying them is by means of the light they transmit toward Earth. The nebula hypothesis is presently the most widely accepted explanation of how our solar system formed. This theory describes the formation of the sun and planets originating from a large nebula which over time condensed into a disk due to its rotational motion. However, many of the details of this theory have not yet been confirmed with direct evidence. This has been changing over the past decade as higher resolution pictures are obtained from the Hubble Space Telescope. Recently such images have shown the coagulation of dust in the disks around young T-Taurus stars, as expected (Padgett et al. 1999). This observational data gives researchers a rough indication of the manner in which material &lt; 1 m in size can form planetesimals in the planet formation process, and data can also be compared against data sets for current computer models examining aggregate growth and their light scattering properties. Advancement in computer systems over the years have allowed for a more detailed examination of planetary formation (Richardson 1995). This has recently included the creation and analysis of dust aggregates built from BPCA (Ballistic particle-cluster aggregation) and BCCA (Ballistic cluster-cluster aggregation) collisions with the use of computer simulations. These methods allows for a detailed examination of the rigid body dynamics involved during the formation process. They take into consideration the size, velocity and charge of the incoming monomer and how these parameters influence the aggregate's construction. A second program, SCSMFO1B, was used to examine the aggregates' average optical properties (Mackowski 1999). Fractal aggregates up to 200 monomers in size were created using computer simulations of BCCA and BPCA. This was done by the use of an algorithm that was based on Richardson's C++ box_tree code (1995) but modified to allow for charged grain in order to examine the effects that incoming particles have on the aggregate being built (Matthews 2006). The greatest advantage of this technique is it allows for a rigorous treatment of dust growth which takes into consideration the physical characteristics of the incoming monomer and the target aggregate such as size, charge distribution, orientation, spin and modeling the resultant rigid body dynamics. This is advantageous over the commonly used statistical methods for approximating the formation of aggregates as it is a self-consistent model. In this study the individual monomers were assumed to be spherical to simplify the calculations. The actual shape of the monomers was found to have a very minor effect on dust coagulation (Chokshi 1993), making this a valid approximation. Three cases were used for examining the effect the population size distribution has on an aggregate's optical properties. The first case used a monodisperse size distribution with each grain having a radius a = 1.7 μm. The second case used an even distribution of monomers with radii ranging from 1 to 6 μm. The third case used a power law size distribution with an γ = -1.8 and with grain radii between 0.5 to 10 µm. Equation 1 is the power law formula used with [n(a) da] indicating the number of monomers of a given radius a and describing the distribution of radius sizes. Another factor which was taken into consideration was the incoming monomer's velocity which is predominantly the result of Brownian motion (Chokshi 1993). If a colliding particles relative velocity is too great it will cause restructuring or fragmentation of the aggregate. Thus an upper threshold of incoming particle velocity is required and is often referred to as the critical velocity of the model. Typical velocities in protostellar clouds due to Brownian motion are less than the critical velocity (Blum 1996), so it is safe to assume in our model that no restructuring occurs. Three different charging models were used to construct aggregates for each of the size distributions. The first model assumes monomers which were neutral. The second model constructed aggregates using monomers with like charges and the final model used monomers with opposite charges. In the like-charged model, each monomer was given a charge based on a potential of -1 V. For the oppositely-charged model, grains with a radius a &lt; 4 μm were given a potential of -1 V and grains with a ≥ 4 μm were given the potential of +4 V. The voltages correspond to a plasma temperature of 0.4 eV which has been shown to be the region where coagulation of the aggregates is most favorable (Horanyi and Goertz, 1990). The monodisperse particles had charges based on triboelectric charging (Konopka et al 2005). The first generation of aggregates was built up to from twenty monomers. Each monomer came into the model one at a time and where directed toward the origin with a slight offset which allowed for near misses. The off center collisions caused a change in the angular velocity of the aggregate being built. This method produced a model of aggregates created by BPCA. Three hundred aggregates were built for each of the model parameters described above. Once the first generation was completed, a second generation with aggregates up to n = 200 was created through collisions of aggregates randomly selected from the first generation. The interested reader may refer to Matthews et al. (2006) for further details. The second part of the project was to determine the light properties of the aggregates built by the use of a FORTRAN program SCSMFO1B developed by Mackowski (1999). The program finds the average light scattering and absorption properties of an aggregate by use of a rigorous solution of Maxwell's equations known as Mie theory (Figure 1). A superposition method was used to find the average light scattering matrix for a given object which consists of non-overlapping spheres. An average value was calculated since slight variations can occur in the scattering matrix due to changes in the object's orientation with respect to the incident light. where Emi denotes the electrical field for each of the monomers, Ea the electrical field for the entire aggregate, and Nm indicates the total number of monomers making up the aggregate. The results were then translated to an outgoing wave vector spherical expansion which is centered at the origin. The interested reader may refer to Mackowski (1999) for details. One condition for the application of Mie's theory is that light must scatter elastically from the object. This means that no change in wavelength or frequency of the light will occur during the scattering process (Van de Hulst 1957). The other important condition is that the object must not have a diameter greater than ten times the wavelength of the light. Once an object reaches this size, it is better to use geometric optics to examine the scattering effect. SCSMFO1B uses the results of the light scattering in the two different regimes to determine the absorption, scattering and extinction efficiency coefficients. where n indicates the dispersion characteristic of the material and k indicates the amount of absorption that occurs as the light travels through the medium (Mishchenko 2002). In this computational experiment the value 1.228-0.0584i was used for index of refraction of water ice (Irvine and Pollack 1967). This value corresponds with the incoming light that was used which had a wavelength λ = 6.3 µm. The program also allows the user to select a number of orientations, specified by polar and azimuthal offsets, to use for finding the average optical properties. These angles are denoted as (α, β) respectively and the values for this study where (0, 0), (0, 90) and (90, 0). This allowed an orthographic projection of the aggregate to be created as shown in Figure 2. (Mackowski 1999). The wavelength is a fixed value in the program so the size parameter had to vary for each radius in the aggregate in order to meet this condition. Therefore the results for aggregates consisting of multiple-sized spheres indicate light scattering properties over a given range of size parameters. where G = πa2 and a represents the radius of the individual monomer. Csca is obtained by integrating the scattered radiant intensity over a spherical surface enclosing the ensemble of monomers. Cabs is found by summing the radiant energy absorbed by each of the monomers and Cext can be found by adding Cabs to Csca (Mackowski 1991). These values called cross sections are calculated within the code and have units of area. A low Q value indicates that an object is more transparent to light then that has a higher Q value. The results from the Mackowski code are listed in Table 1. This table shows the efficiency factors obtained from the population created by a monodisperse size distribution. These values are the averages determined by ten trails for each of the data runs described. Each trial was run with three different orientations (as shown in Figure 1) and then averaged together to reduce error due to shape of the aggregate. The value of Qext, Qabs and Qsca increased between the 1st and 2nd generation for the monodisperse neutral and oppositely charged model. This is to be expected since the aggregate has increased in size which would lead to more absorption and scattering. The like charge didn't increase its efficiency factors from the 1st to 2nd generation. This isn't to upsetting since the like charge aggregates could only be constructed to hold n = 30 monomers, instead of the targeted n = 200 for the 2nd generation. Results indicated that no notable difference is seen in the total extinction between aggregates built from monodisperese monomers with a neutral or opposite charge. The results came back inconclusive for the aggregates built from even and power law distribution of monomer radii. The most likely reason is due to the changes in the size parameter caused by varying values for the radius. Future work could compensate for this by increasing the run time for each data run. Other possible variables that can be explored in further detail include different incoming wavelengths and variations in the composition of the aggregate. This paper presents a means in which the optical properties of aggregates built form BPCA and BCCA can be determine by a numerical method. One of the greatest uses in astronomy for conducting this experiment is for establishing a better understanding of early planet formation. Refining this technique would allow researchers a means of comparing future observations with theoretical models. I would like to thank Carole Sutton, Ryan Hayes, Lorin Matthews and Truell Hyde for allowing me the opportunity to pursue this research. Mackowski, D. (1999) SCSMFO.FOR: Calculation of the Scattering Properties for a Cluster of Spheres. User guide accompanying the SCSMFO.FOR code. Chokshi, A. et al. (1993) Dust Coagulation. The Astrophysical Journal, 806-819. Matthews, Lorin Swint and Truell W. Hyde. 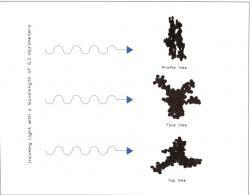 (2004) Effects of the Charge-Dipole Interaction on the Coagulation of Fractal Aggregates. IEEE Transactions on Plasma Science, 586-93. Padgett, D. et al. (1999) Hubble Space Telescope/Nicmos Imaging of Disks and Envelopes Around very Young Stars. The Astronomical Journal, 1490-1504. Richardson, Derek C. (1995) A Self-Consistent Numerical Treatment of Fractal Aggregate Dynamics. Icarus, 320-335.